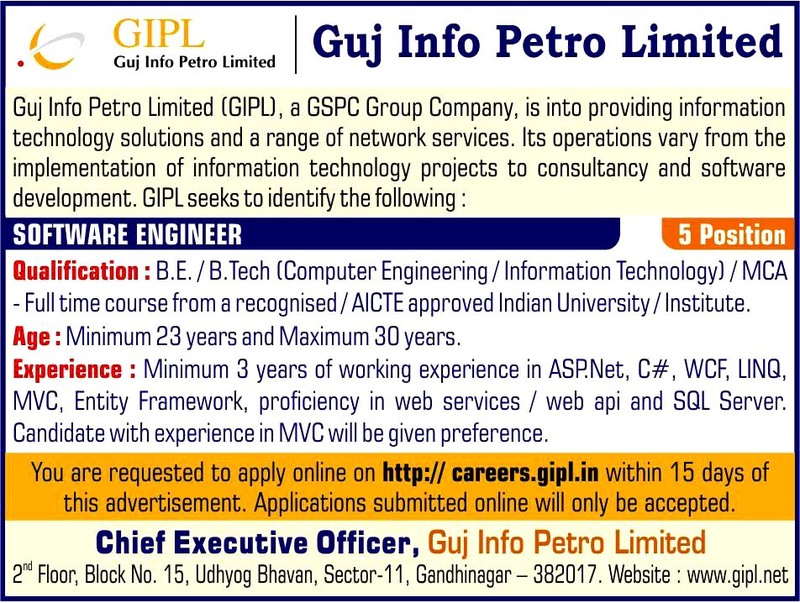 Gujarat Info Petro Limited (GIPL) published jobs official notification for the post of Software Engineer at GIPL Website http://careers.gipl.in/ and other Jobs details of GIPL Recruitment 2017 are mention below. Guj. 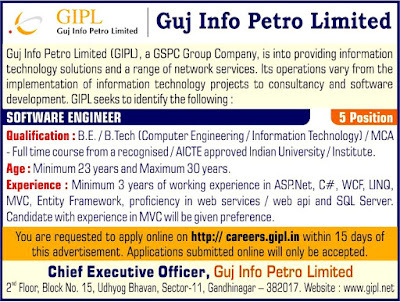 Info Petro Limited (GIPL), a GSPC Group company, is into providing information technology solutions and a range of network services. Its operations vary from the implementation of information technology projects to consultancy and software development. GIPL seeks to identify the following. Educational qualification: Candidates Need to Degree of B.E / B.teach (Computer Engineering / Information technology) / MCA – Full Time Course from Recognized / AICTE Approved Indian University / Institute check & read notification. Experience : Minimum 3 Years of working experience in ASP.Net, C+, WCF, LINQ, MVC, Entity framework, proficiency in web services / web api and SQL Server. Candidates with experience in MVC will be given preference. How to apply:Interested and eligible candidates are requested to apply online on http://careers.gipl.in within 15 days of this advertisement. Applications submitted online will only be accepted.